Blake Shelton's fame extends far beyond his successful music career, thanks especially to his role as a coach on NBC's Emmy-nominated "The Voice." The country crooner's worldwide appeal wasn't something he chased, as he insists he's simply a lucky guy. "It wasn't planned out," Blake admits to Country Aircheck. "Ironically enough, over the years of being a Nashville country artist, I always had people tell me, 'Hey, you should be on TV. You need to be a comedian or something like that.' But it was never something I pursued or talked about. When 'The Voice' just kind of fell into my lap, I don't know if I'm one of those people who believes in meant-to-be or not, but it sure seemed like that's what it was, because it does feel natural for me to do this." The Oklahoma native has helped two teammates, Jermaine Paul and Cassadee Pope, win "The Voice." And when it comes to Blake's own career victories, he freely admits he's had some heavy hitting help, too. "Thank God for having someone like [manager] Narvel [Blackstock] who has a lot of background in television. Without his input on this, I could have had a good career, but because of having him I've had a great career now. Knowing which television opportunities are important and which ones aren't makes a difference. Even different from Reba's television career, I'm kind of in uncharted territory for a country artist." Speaking of being a country artist, the 36-year-old insists that is his first job, and everything else is just icing. He's working hard to make sure "The Voice" complements his musical priorities, rather than overshadows them. "More than anything, I worry about losing my spot in country music because that is easily the most important thing in the world to me when it comes to my career," Blake says. "Country music is my heart. Just because nobody else is doing it this way doesn't mean it's wrong ... My career is kind of an oddity, but I think deep down people know I'm an expression of the country lifestyle, middle America and those types of values. I'm a country artist first and just happen to be on television doing it." Season 4 of "The Voice," which will include returning coach Adam Levine, as well as new coaches Usher and Shakira, will premiere on March 25 on NBC. 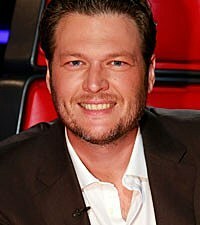 Blake will spend the next few months putting the finishing touches on his upcoming album and plans on hitting the road in 2013, as well.